Raymarine product assurance engineer Drew Gorman (left) shows a journalist from Brazil the CHIRP DownVision sonar in one of six testing stations on the company&apos;s boat. With 40 products introduced in 2013, FLIR Maritime, which includes Raymarine electronics, has been eager to show the world how it creates, manufactures and tests its sonar, radar, pilots, instruments, displays and thermal imaging cameras. So the company in June invited 20 journalists from nine countries to its global headquarters in Fareham, England, for two days of learning about and testing much of the new equipment. FLIR Maritime executives, engineers and marketing professionals made PowerPoint presentations and set aside time for interviews. Raymarine has held regional press presentations in the past few years, “but this is the first time in a long time we’ve done an international event, and it was important because we are an international company,” Hands says. In 2013 Raymarine saw 6 percent growth in revenue and 24 percent growth in operating cash. FLIR Maritime represents 12 percent of FLIR’s business. Raymarine employs 300 people and has more than 100 engineers. Sixty employees work in the U.S. office in Nashua, N.H. This huge console includes just about every piece of Raymarine electronics. It was linked to a simulator so journalists could take a virtual sea trial. The new products the company recently introduced include two multifunction displays in the Raymarine aSeries (9- and 12-inch screens) and a third that is its largest Glass Bridge MFD — the 19-inch gS195. Earlier in the year, FLIR Maritime debuted the FLIR One, which the company says is the first thermal imager designed for smartphones. FLIR One attaches to any Apple iPhone 5 or 5s and displays a live thermal image on the screen. FLIR wants to make thermal imaging technology commonplace on boats, executives said at the event. “We are convinced that thermal imaging will be a significant part of leisure boating,” Raymarine general manager Gregoire Outters said during his presentation, citing the corporate mantra of “Infrared Everywhere” and a marketing message that describes FLIR thermal night vision technology as a “sixth sense” for boaters. Raymarine also spotlighted another relatively new product, the Evolution autopilot, which has a technology called Hydrobalance. It uses a mathematical model to compensate for the inaccuracies of an autopilot system tied to the hydraulic steering system of an outboard boat. The product allows Raymarine to dip into small-boat market segments. Historically, the company’s products have been geared to boats larger than 35 feet. Raymarine say it tests its products for all types of real-world conditions going beyond what is necessary. Another business goal for FLIR Maritime: Gain competitive advantage by owning the entry-level and high-performance price point in each market where it functions. Outters talked about the company’s “Capture the Corners” business plan. For instance, the entry-level Dragonfly sonar units sit in one corner and the gS Series of Glass Bridge MFDs sits in another. Here one unit undergoes exposure to extreme cold. On the first full day of the event, journalists toured the company’s research-and-development facility. Raymarine prepared several stations in the two-story building in Fareham to show the press its latest products and allow writers to talk to the electronics company’s engineers and product developers. The five stations showcased Raymarine’s multifunction displays and Lighthouse II user interface software, sonar capabilities and Dragonfly sonar units, thermal imaging cameras, Evolution autopilot, and electromagnetic and environmental testing chambers. Engineers pointed out that quarterly software updates are released for all of the Raymarine-branded multifunction displays that are based on the LightHouse II operating system. In the sonar display room, the company’s entry-level Dragonfly stood out as the star of the show. 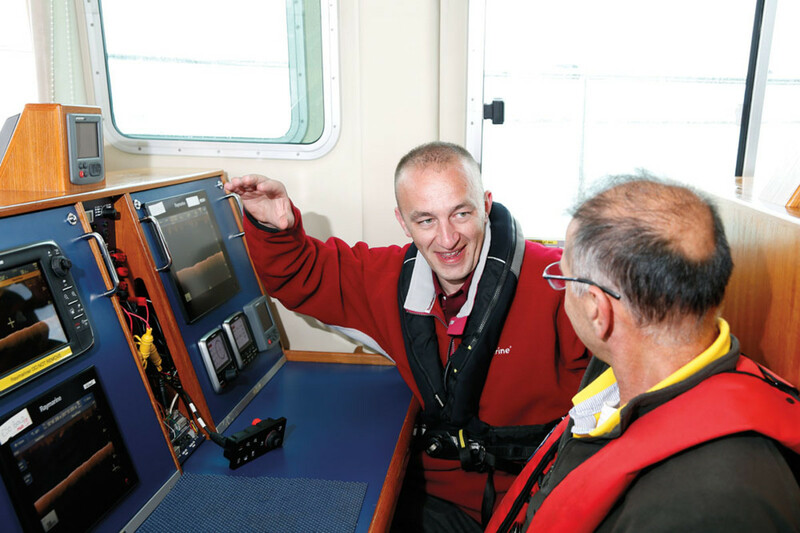 “We designed the transducers in conjunction with the electronics so we have the best match to get the performance we want to achieve,” says Paul Stokes, sonar systems architect. With Dragonfly sonar, Raymarine is working to make a name for itself in the freshwater fishing market. 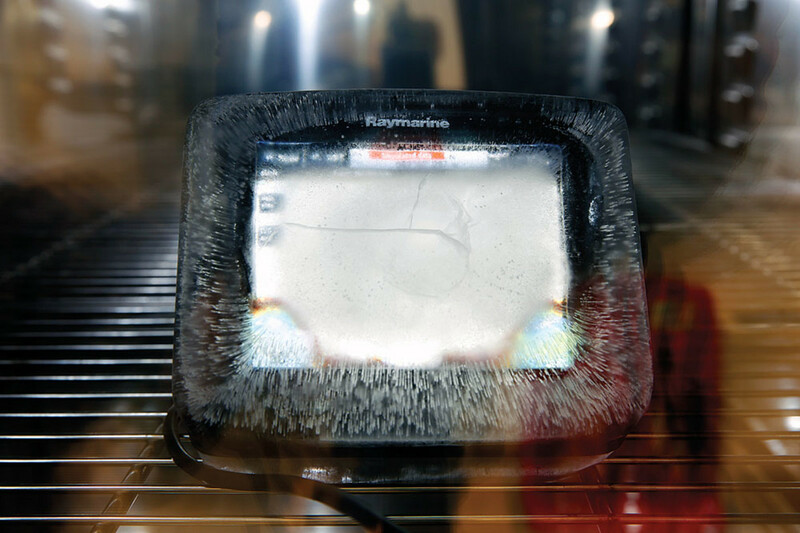 The electromagnetic testing makes sure the products are not absorbing or emitting too much radiated transmissions, according to Raj Patel, Raymarine hardware development manager. “We test to meet standards, but our testing goes far beyond that,” he says. Testers subject Raymarine devices to heat, cold, water ingress, salt, fog, near lightning strikes and other real-world factors. “This is where they shake and bake things,” Hands says as we head into the fog and salt-spray testing area. I watched engineers put an a9 display through a vibration test, fire a high-pressure water stream at an eSeries display, cook an antenna in a heating chamber, freeze an aSeries MFD, and smash a small display by dropping a weight on it. I stepped aboard a test boat, the Hardy 42 trawler Raymariner with twin 470-hp MAN diesels. The English-built pilothouse semidisplacement boat can reach a top speed of 27 knots. 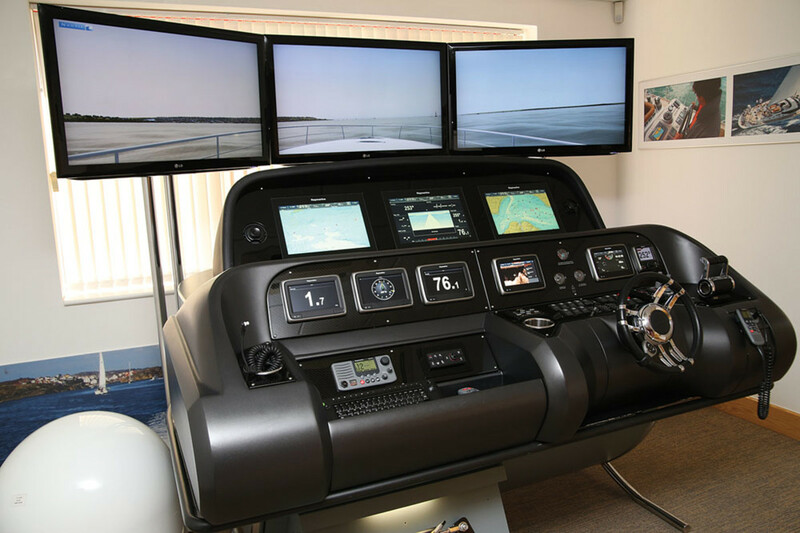 The pilothouse’s six testing stations each have a large flat panel where at least two displays or instrument screens are mounted. The Hardy was equipped with 25 GPS units. She also was fitted with six radar antennas, a few dozen multifunction displays from 5.7 to 19 inches, five autopilots, four AIS units, three fixed-mount VHF radios, and 20 through-hull transducers. The transducers were mounted athwartships in four rows; there were also what Raymarine calls “moonpool” panels, which are essentially sections of the hull bottom that can be removed while the boat is floating to allow additional through-hull transducers to be fitted without lifting the boat, says Raymarine product support manager Derek Gilbert. “This allows us to test multiple transducers at the same time and gives maximum flexibility,” he says. All products targeted for testing are mounted inside the pilothouse (accept for antennas and cameras). The flybridge helm station is home to the boat’s own array of electronics. I sat in the companion seat on the flybridge as Gilbert piloted Raymariner off Cowes, on the Isle of Wight. In addition to overseeing the product support team in the U.K., Gilbert is qualified to be a skipper on Raymariner. Gilbert, who volunteered to help at the press event, has a team of six engineers in product support who field feedback from consumers, influencing product design. “We actually speak to more than 25,000 people per year, just in the U.K.,” he says. Product assurance engineer Drew Gorman was also on board Raymariner as we headed toward a wreck to try the Raymarine CP100 with CHIRP sonar. A big part of the job is making sure the software is up to spec and meets standards and mandates, Gorman says. The Hardy ventures as much as 60 miles offshore to test some equipment, including sonar in deep water, he adds. In addition to Raymariner, the company works with the owners of 60 private vessels — commercial and recreational — around the world who test Raymarine products. Sailboats, convertibles, express cruisers, center consoles, RIBs, power cats, trawlers — you name it. Testing is carried out in a range of locations and conditions. For example, Singapore, with its heavy boat traffic, is perfect for AIS and radar testing, Pope says. Raymarine rounded up five private boats for the press event. They were docked at the Royal Southern Yacht Club in Hamble. In addition to the Hardy trawler, I jumped on a 30-foot Cheetah power cat with twin 300-hp Suzukis and a Prestige 500, a sport cruiser from Beneteau with Volvo Penta IPS600s. I’d say that counts as real-world testing.